Lotsaloot 5-Reel is the slightly more modern version of this game, the other title offering 3 reels. The design hasn’t really changed that much, keeping the same focus on the pot with gold coins, but adding some Irish themed images to the mix of symbols, like the clover. It’s not all good though, as the game also uses playing cards now, and they’re definitely not fun to look at. The features were kept pretty much the same, and the progressive jackpot is the same one also. 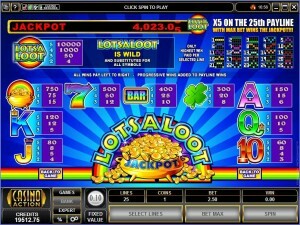 The Lotsaloot slots are created by Microgaming. You obviously know that it has 5 reels from the title. It also has 25 paylines and only one feature, a very simple wild. There is a progressive jackpot to go after, plus the game’s own prizes that reach only $1,000 (meaning 10,000x the line bet though). The features were kept just as basic as those from the 3 reel title. What that means is that you only get one feature symbol, a wild. Unfortunately, it no longer offers you a multiplier, so the classic title actually has better features than the modern one. The wild symbol is easy enough to take advantage of, as it will automatically substitute for other symbols when it lands in positions where another symbol would be needed. If it can take the role of another, and help you create a new combo in the process, the wild will do that. However, it can also create its own combinations, when two to five positions on a line are occupied by it, from left to right. 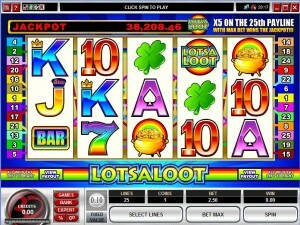 It can pay up to 10,000x, or give you the progressive jackpot if the five wild combo forms on the 25th line at max bet. The game might have 25 lines, but the maximum bet only goes up to $2.50, just like the 3 reel slot. Each of those lines gets a single coin wager, fixed at $0.10, so it should be a very cheap game to play. Payouts go up to 10,000x the line bet most of the time, meaning up to $1,000 cash. However, if you get that same combo of five Logos on the 25th line, you win the progressive jackpot instead. The value at which it is usually won averages at about $21,000, but it went as high as $72,000 in the past. The design hasn’t improved much. You get more reels obviously, more symbols as well, but they’re not special enough. The same game logo acts as the wild, a couple of classic icons are still present, and then you have the pot of gold and the clover as the Irish themed symbols. The rest of the new additions consist in boring playing cards. 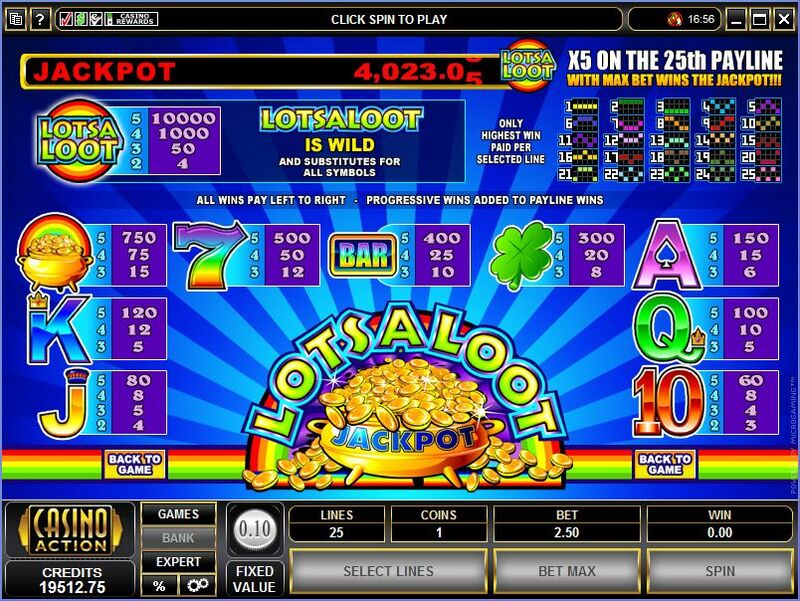 Symbols: Lotsaloot Logo (wild, 10,000x), Pot of Gold (750x), Rainbow 7 (500x), Rainbow Bar (400x), Clover (300x), Ace (150x), King (120x), Queen (100x), Jack (80x) and 10 (60x). It does even worse feature wise than the 3 reel title, but it’s still a 5 reel game and it has more paylines, so try this one over the classic variant if that’s the kind of slot you prefer. 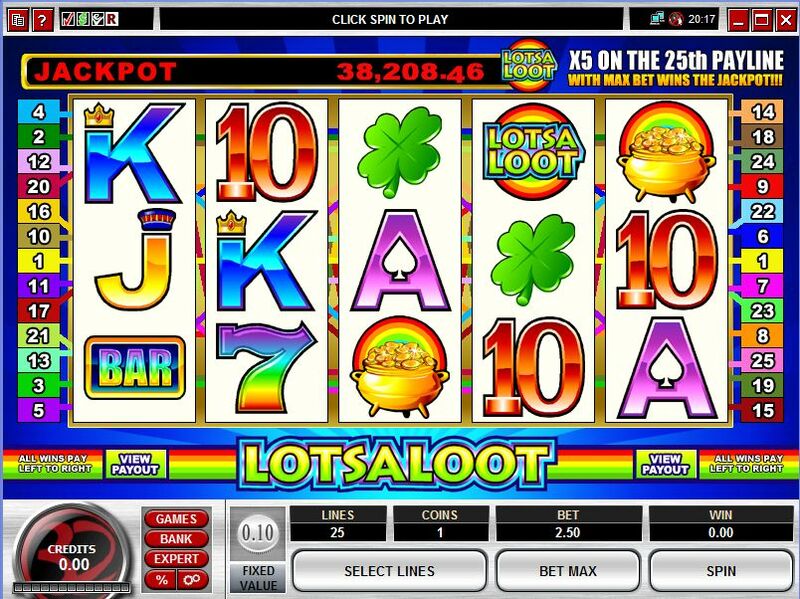 Lotsaloot 5-Reel can be found at any Microgaming casino, where you get a chance to play it for real money or in free mode.